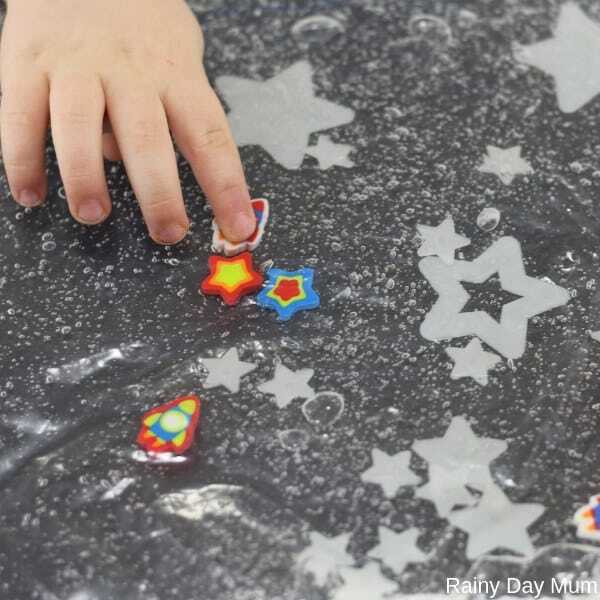 Today we’re combining two of our favorite things: sensory play with a space theme. 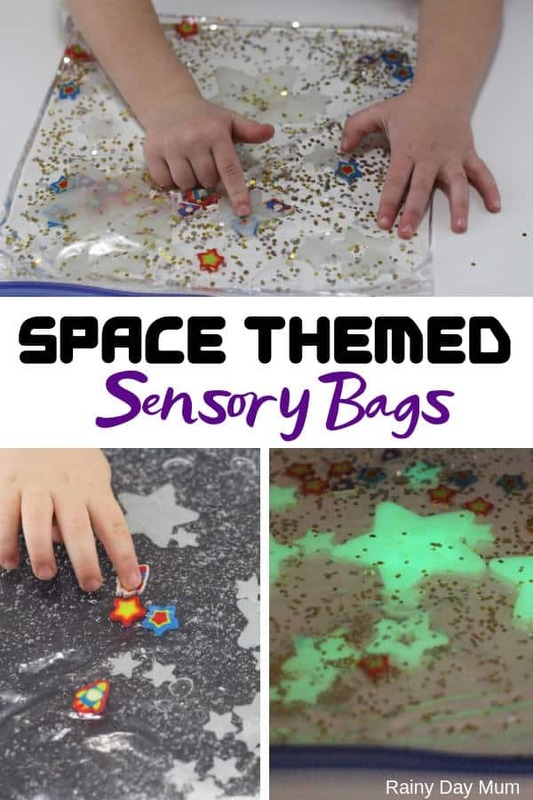 Our space themed sensory bags are mess-free sensory experience for kids. We’re showcasing two different options for what to put in the sensory bag. If you turn off the lights, they’ll even glow in the dark! 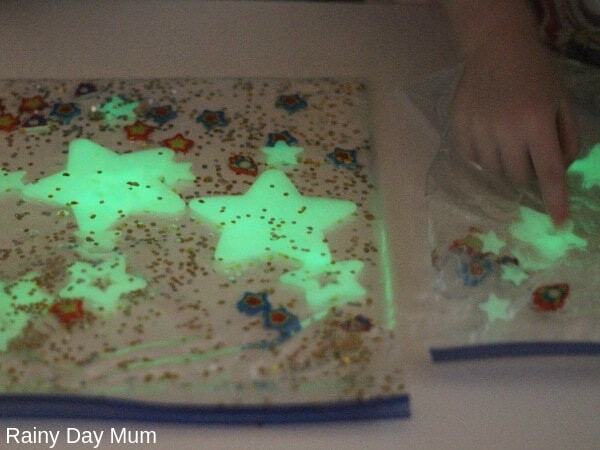 So here we go our simple to set up Space themed Sensory bags for Toddlers and Preschoolers that Glow in the Dark. 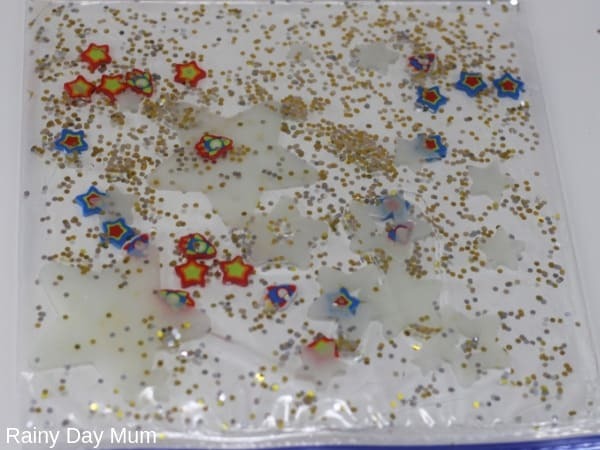 We have included links to the products we used to make these sensory bags. If you purchase via the links we may earn a small commission. Remove any labels from the plastic storage bags using rubbing alcohol and a paper towel or cloth. Sensory bags need to have some type of filler to provide the main texture. I used hair gel for one bag and water for another. You can also use water beads, sand, oobleck, slime, play dough, etc. 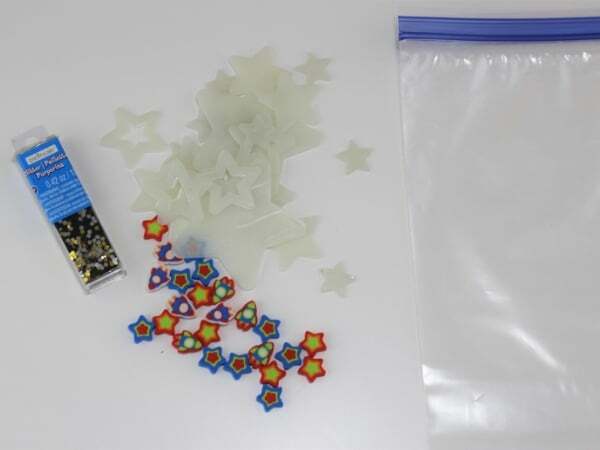 Next, add the glow in the dark plastic stars and mini erasers to your bags. I chose to use a bunch of small stars and a handful of mini erasers in the bag with hair gel. In the second bag with water, I added a variety of sizes of stars and more mini erasers. I also included chunky glitter in this bag. Tape the bags shut to help keep the bag from coming open. You can also tape the bag to your table to keep it from sliding around. Encourage your child to touch and squish the bag. Ask her to move the stars and erasers around. Can you move the rocket ship onto a star? Can you move the blue star around the yellow stars? Turn the lights out and you have a completely new experience. The stars glow in the dark. Squish and push and move them around. 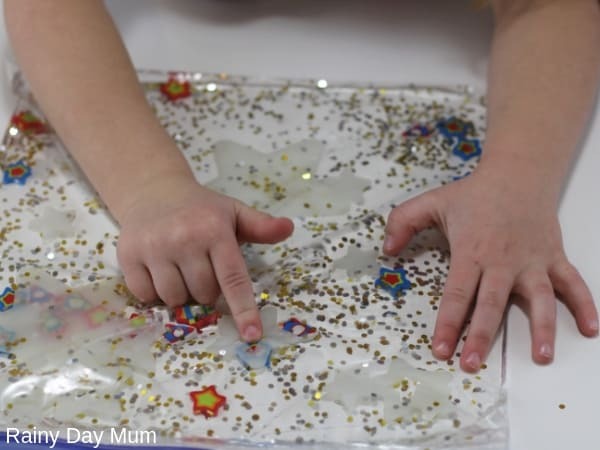 You can also work on counting skills with the sensory bags. How many glow in the dark stars do you see? How many rockets will fit on the biggest star? Sensory bags can even be used to further language skills. While your child is focused on the sensory experience, talk about what you see in the bag. Ask your toddler to name the objects. Can you find a red star? Where is the blue rocket? Can you find something that starts with the /s/ sound? I see a star. Star starts with “s.” The letter “s” makes a /s/ sound. 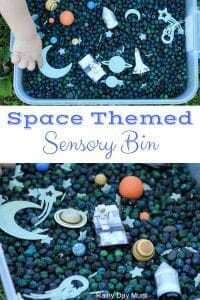 Space Themed Sensory Bin – Add space toys, planets, and stars to a bin filled with dyed chickpeas. 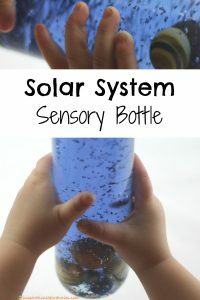 Solar System Sensory Bottle – Learn about the planets in the solar system with this calming sensory bottle. 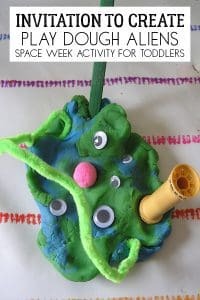 Invitation to Create Play Dough Aliens – Use a variety of craft supplies and play dough to make your own alien. 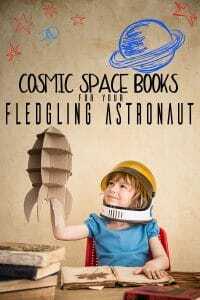 We have picked our best Space Themed Books to read aloud to your Toddlers and Preschoolers. 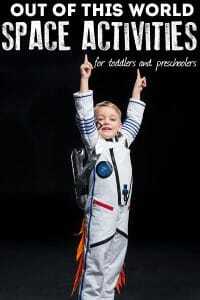 These are fun and perfect for your little Astronaughts and you to read together. 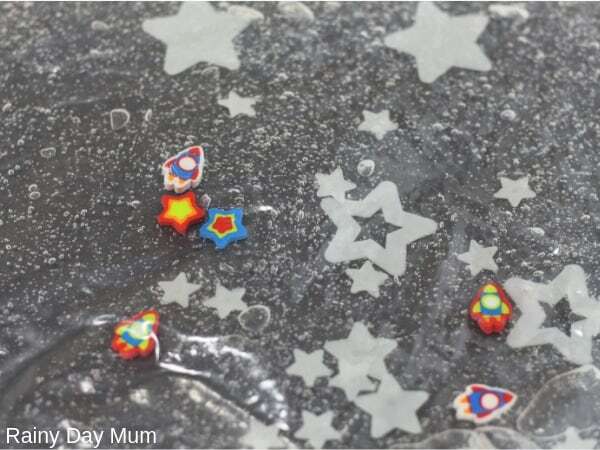 Looking for even more Space Themed Activities for Toddlers and Preschoolers – then check out our complete collection of ideas here on Rainy Day Mum. It’s one of our favourite topics and we love sharing crafts, learning and activities that take you and your tots out of this world.